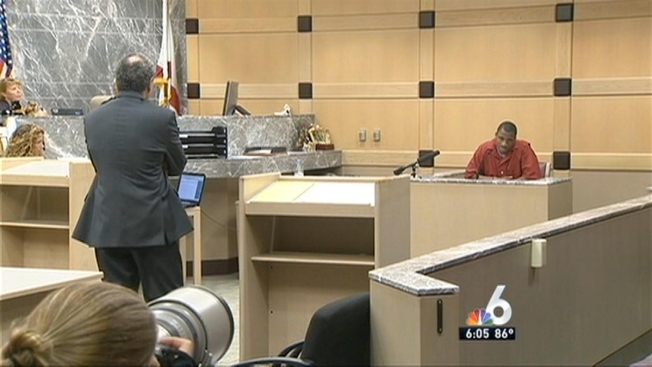 The sentencing phase of a South Florida man convicted of murdering two people during a string of Dunkin’ Donuts robberies in 2008 continued Monday, with James Herard again daring a judge to give him the death penalty. Herard, 25, was convicted on 18 of 19 counts related to the robberies and murders. The same jury that convicted him recommended the death penalty for Herard. Herard dared the judge to sentence him to death during the first part of the sentencing hearing on Sept. 12. “Honestly and truly, I’m not asking you to spare me," Herard said. "Go ahead and do what you gonna do. I pretty much dare you to give me the death sentence, because I’m innocent." Prosecutors said Herard didn’t pull the trigger in the 2008 murder of 39-year-old Eric Jean-Pierre. But, they say he, along with other members of a gang, were part of a “body count competition” and Herard pushed Tharod Bell to murder Jean-Pierre. Herard was previously convicted of the murder of 58-year-old Kiem Huynh in 2008. He received sentences of life imprisonment for Huynh’s death. Herard made national news when he barked like a dog during an appearance before Broward Circuit Judge John Hurley after his initial arrest. The judge in the case set a final sentencing date for October 20th when Herard will learn whether he lives or dies.